It's been quite awhile since I mentioned our sippy cup battle. I know, and I'm sorry. We started it in late October of last year, and the saga continued into November as Zack stubbornly held out. By Thanksgiving, we'd given in. He had his bottles back. I didn't want to have to write something all negative, like "well we've gotten nowhere fast, Zack wins every battle hands down because I can't take his screaming." I didn't want to bring it up, until I had some real progress to report. One day last week, the boys' teacher called me and said that she thought Zack was thirsty at school, because he sticks his butterfly chewy under the faucet and then licks the water off of it. So she wondered if I could send a sippy cup into school for him. I thought quickly - well he doesn't actually drink from sippy cups yet, but there's no way I'm sending a bottle in to kindergarten with him - and reinforcing his bottle obsession. So I told her, sure, I'll send in a sippy cup, you see if you can get him to drink from it. Good luck with that. And the very next day she emails and says casually "Zack drank about half the water out of the sippy cup today." "Are you kidding? He drank out of a sippy cup? He drank WATER out of a SIPPY CUP?!" I wrote back. So we've kept a sippy cup at school now for the past few days. Apparently since he has never, ever seen a bottle at school, he didn't even fight it. He seems to accept that it's the sippy, or nothing at school. She did say the second day he was less enthusiastic about it. She had to reinforce (that is ABA therapist speak for "bribe") him with Cookie Crisp to get him to take a drink. But, he's doing it. So, we have created a plan to bring the sippy success into the house. I'm going to have him drink from sippy cups every day at school, until it's just so normal for him, he doesn't even think twice about whether to accept it or not, when it's offered to him. We'll start putting juice in it at school, the same juice we drink at home, so it's real tasty and familiar. Then one day, he'll get to bring his sippy cup home on the bus. Maybe more than one day. He can drink from it the whole way home. And then he can bring it in the house. And on that day....perhaps.....there just aren't any bottles in the house anymore. So it will, in theory, be the smoothest transition possible. If I have my way, he won't even realize a change took place. 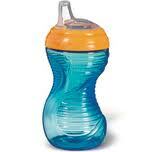 We'll pave the sippy cup road from school to home as smoothly as possible so that it just slides in, seamlessly. How's that for Feel Good Friday material! That's great. It is amazing what a child will do for someone else that they will not do for their own parent. Congratulations! Some good news was in order for this day! I didn't actually say "good luck with that" to the teacher. I'm not that smart-alecky. That is fantastic! I was wondering about the sippy cups and how it was going. I might have said "good luck with that" to a teacher. Sometimes I forget to keep my thoughts to myself. That's great...I am hoping the same thing happens for us with our son in accepting school lunch when he is such a picky eater! Don't you love to see progress. Best luck with this seamless transition. That is good news.